... Ta-da - Melissa, from Cedar Park, Texas. Well done, Melissa! The last issue of Home Swappers Newsletter included a competition to encourage subscribers and members to visit this blog to look for the answers to where three articles had recently been published about home exchange. Most of the entrants were current Home Base Holidays members but Melissa, chosen at random from print-outs of all entries, was a newsletter subscriber. Fortunately, Melissa was delighted to win a one year's free home exchange listing and has already claimed her prize by adding her home exchange offer. Lovely 3000 sq ft. home in the heart of the Hill Country. Ranked one of the 10 best cities in America for families. Can provide video, library, pool, tennis, and gym memberships. Walk to park, pool, tennis, cricket pitch, soccer fields, market, basketball court, jogging path. 15 min. from the heart of Austin - the live music capital of the world. Museums, amusement parks, lakes, world class BBQ, Upscale & Outlet shopping, are all a short drive away. 3 hours to both Dallas and Houston. Read the full description of this home exchange offer, HE20207. The photo is of Melissa and Greg's children, from left to right and back to front: Jeremy, Karina, Toby, Olivia, and Jacob. 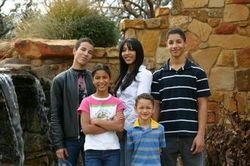 This blog focuses on home exchange and I try not to stray off topic too often. However, today is a special day for bloggers around the world, a day when many will be publishing posts about abuse in all it's terrible forms - from domestic violence, cruelty to animals, school bullying, prisoners detained without fair trials, in fact, to abuses of all kinds. This day, when bloggers are uniting to draw attention to abuse, came about from a call for joint action a few weeks ago on the discussion board of BlogCatalog, a social blog directory. Bloggers Against Abuse September 27th, 2007 snowballed as the idea was forwarded to many others in the vast blogging community worldwide. Every blogger will have their reasons for focusing on a particular form of abuse today, some no doubt from painful personal experiences, others from a concern for a local or widespread abuse that has particularly affected them. I would like to draw attention to the work of Amnesty International. I have signed many Amnesty petitions over the years, each highlighting a particular case of terrible injustice to a fellow human being. Reading the literature always leaves me feeling overwhelmed by the enormity, and seemingly never ending cases of serious abuse. I have always had an admiration for Amnesty volunteers, like the elderly woman in our London suburb who sets up her table in our busy shopping street on many Saturdays during the year, rain or shine. With the latest petitions displayed on neat rows of clipboards across the table, she quietly explains each special case in turn to any of the busy shoppers who stop by. The next time you see an Amnesty stand, please take the time to stop. Read the harrowing personal case details and sign your name to each petition as a tiny gesture towards stopping abuse wherever it's found. Find out more about what you might do to help the work of Amnesty, get involved in the discussions on the Amnesty blog and, if you have a blog or website, stand up for human rights by spreading the word with Amnesty and sign up to receive regular email updates on their campaigns, reports and events. Hello - my name is Paul Ferguson and we have recently joined Home Base Holidays - primarily in order that we could get in touch with you. Our property reference is HE20121 - please note my wife Sharon has just taken a picture of the front of the house this morning but has not yet loaded it on the site - we'll make sure it's there in the next day or two. We've always had an interest in visiting Iceland. Our daughter did a degree in earth sciences (mainly geology) and we are keen to use her as a guide to some of the fascinating geological features in Iceland - needless to say she's very keen to go herself. She's just about to start her year of writing up her thesis for her doctorate but after that we anticipate her heading off abroad and we're therefore trying to arrange a trip to Iceland before she leaves. We've never done a house exchange before but it seemed sensible to explore the idea and when we went onto the Home Base site and read about you and your property we felt we'd like to see if it might work. In an ideal world the three of us would like to visit Iceland towards the end of June or early July 2008 for up to 10 days. I'm not sure how these things work but we could certainly arrange to be away from our property at other times than when we were in Iceland, i.e. from our point of view an exchange doesn't have to be simultaneous - clearly we appreciate that that might not be as convenient for you. You'll see from the site that we're both semi-retired at the moment, both of us being 51. Sharon had to spend some time recently looking after her terminally ill mother and that meant she was away from home. When her mother died it coincided with my pension becoming available and we decided to take an extended break. I'm an ex-banker and Sharon is an accountant. We've been thinking about going back into some form of part-time work but at the moment the only thing I do is act as non-executive director of our local Primary Care Trust. I'm not sure what you like doing on holiday and how much you know about the UK. I see you like golf - well there are lots of courses round here although I suspect that not all of them allow visitors (eg Birkdale). I might be able to arrange with friends invitations to their clubs. The coastline at Southport itself isn't very interesting but about 8 miles down the coast at Formby there is a red squirrel reserve and an equal distance inland is a major bird sanctuary. We like walking and if you've not been there already then you should definitely visit the Lake District National Park. Going in the opposite direction, Snowdonia in North Wales is easily reached - my daughter and I went up Snowdon and back comfortably in the day - although there's a little train up the mountain if you want to take the more relaxing approach! We like going out to the theatre and concerts - in Liverpool and Manchester there are numerous museums, art galleries, theatres and concert halls. Liverpool has some fascinating buildings and there's fun things to do celebrating the heritage of the Beatles! Depending on when you were to visit there are many Premiership football grounds within easy reach (indeed, our son works at Manchester City) and if it's the summer then you could always come along to a cricket match although the kids might find it a bit of a slow game. 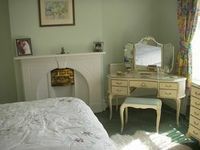 Churchtown village is a 5 minute walk and offers 3 good restaurants and a pleasant pub. There are shops 100 yards away and very large supermarkets within a 10 minute drive. If you enjoy shopping then Southport has a famous parade of shops whilst there are massive retail centres, particularly in Manchester (I can't stand shopping!). I think the major downside to coming to Southport is if your main interest would be London. Although you can get there by train in 3 hours these days you'd definitely want to stay overnight - it's not a journey that you'd want to do there and back in one day unless you had to (I, along with lots of business people, have had to do it regularly but it's not something you'd want to do on holiday). Hopefully that gives you rather more of an idea about where we live, about us and what we'd like to try and arrange. There aren't many properties in Iceland so I expect you've probably had lots of offers of exchanges. If we're too late or if you want to be in a different part of the UK/world then thanks for reading the em and very best wishes. If you think there may be a possiblity for an exchange then we'd love to hear what would work for you and we'll see what we can do. 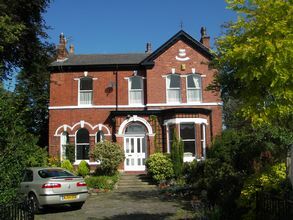 'Our house was built in 1879 and is in Churchtown, a pleasant residential part of Southport, situated 1 mile from the coast. The Botanic Gardens are 5 mins walk away and there are several good restaurants and shops on the doorstep. See the full exchange offer and more photos, HE20121. It's disappointing when someone who lives in exactly the place you want to visit doesn't reply to a home exchange offer. So, when Paul, a recent Home Base Holidays member from Southport, England, let us know he hadn't heard back from a member in Iceland, I replied with a number of reasons why the member might not have responded, e.g. he could be away and not checking email regularly or may have overlooked the exchange offer message if it was filed in a junk folder by mistake. I also gave Paul some suggestions for improving the response rate to messages sent to members, including ideas for writing an enticing, personalised and informative exchange offer message. I had asked him to forward his offer message so that I could re-send it to the member in Iceland. On reading Paul's forwarded message, I knew it shouldn't be any fault of his that he hadn't received a reply. Paul has kindly allowed me to reproduce his exchange offer message and this will be published tomorrow. 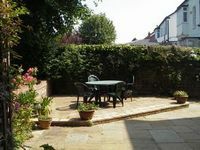 'Our house was built in 1879 and is in Churchtown, a pleasant residential part of Southport, situated 1 mile from the coast. The Botanic Gardens are 5 mins walk away and there are several good restaurants and shops on the doorstep'. See the full exchange offer and more photos, HE20121. According to a recent TripAdvisor Survey, Traveling With Pets for the Dogs, 53% of respondents who were pet owners take their pets on vacation with them. Americans (56%) were more likely to travel with their pets than UK travellers (41%). The survey makes fascinating reading (I wonder how respondents got the answers to the question on which country their pets most enjoyed visiting? However they did it, the top dog slot was the USA at 61%, followed by Canada and, in third place, the UK). The main purpose of the survey was to find out which hotels and B & Bs were rated most pet friendly. It is not really a surprise that smaller, individual B & Bs tended to rate higher than hotel chains. But the survey didn't cover private home owners who are willing to have home exchange guests bring pets to their homes. Many home exchangers are happy to look after their exchange partners' pets during a home swap. And, when this can be arranged, it's certainly less stressful (and cheaper) to be able to leave much loved pets in their own homes rather than to board them in a kennel. Home Base Holidays members can indicate if they need pet care and/or are willing to look after pets while on a home exchange. It's always a good idea to offer to provide back-up support though so that your exchange guests won't feel tied down if they want a few days travelling away from your home. You can easily find members who have indicated that they would be willing to look after pets by using Advanced Search and ticking the box beside Pet Care Offered. Now, based on the knowledge, supported by the TripAdvisor Survey, that many people can't bear to be parted from their pets while on vacation, we have very recently added a new option to the membership form, Pets Welcome. Look for the little dog icon beside summary listings in search results. Although there won't be a large number of members offering this until it has been available for longer, surprisingly, even after a week, a few new and renewing members had already included Pets Welcome in their exchange offers, a sign that this new option is likely to be very popular. Listings showing 'Pets Welcome' can also easily be selected by ticking this option on Advanced Search. Family house in North London 'village' of Stoke Newington. Looking for 1 - 2 weeks Xmas/New Year 2007/8. Weekend exchanges open. 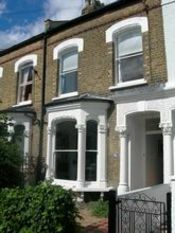 Stoke Newington is an area of London about 5km north of the City and West End. It still retains an individual and slightly alternative character of its own. Its a great base from which to explore London and a place to spend some time in in its own right. "Stoke Newington is a medieval village that, while now swallowed up by the British capital, has never truly become a part of it. One of the most culturally diverse parts of London, Stoke Newington is today a great place to eat, drink and shop as well as being an excellent detour from the beaten tourist track." (Lonely Planet Guide to London 2006).